Have you been enjoying this nice, unseasonably warm weather over the last several days, and even weeks in the Finger Lakes? Take the opportunity to get outside on Monday, because big changes are coming, according to FLX Weather Meteorologist Drew Montreuil. Temperatures will reach the upper-40s for most in the Finger Lakes on Monday, with a few locations reaching 50 degrees. While temperatures will be warm again on Tuesday, winds will whip ahead of a cold front, which will send temperatures cratering downward. Montreuil says that rain will persist throughout much of the day on Tuesday, with wind gusts over 40 mph likely. He says that a few gusts over 50 mph are entirely possible, as well. Tuesday night, temperatures will fall through the 30s and into the 20s, which will be the ‘change’ that the region has been hoping holds off. Montreuil says that the Finger Lakes will escape any major snowfall from the pending lake effect event expected Wednesday through Friday – those traveling should use extra caution. Temperatures are expected to remain in the 30s through the remainder of the week, but next week looks even colder, according to Montreuil, who says that high-temperatures will struggle to get out of the 20s. “Lake effect snow will quickly develop behind the front on southwest winds. This will keep the lake effect northwest of the Finger Lakes, primarily confined to areas north of Buffalo and west of Rochester through Wednesday. Outside of the lake effect, sunshine is likely across the Finger Lakes with gusty winds in excess of 30 mph. Temperatures Wednesday will be in the upper 30s. Wednesday night, winds will start to turn towards the west. This should bring the lake effect snow bands south with the Lake Erie band moving into the Finger Lakes. The heaviest snow will be west of the Finger Lakes, but on and off flurries and squalls are possible throughout Thursday. 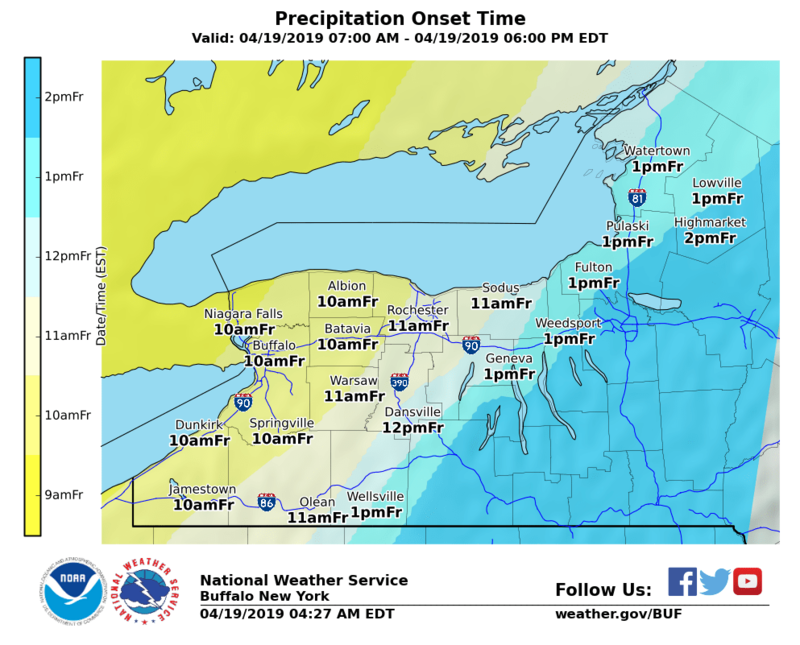 A couple of inches may fall in the vicinity of a Dansville to Penn Yan to Cortland line, though the exact location will still need to be resolved in the coming days. Temperatures will continue to fall, with highs in the low 30s Thursday into Friday. Winter is coming to the #FingerLakes in the form of cold temperatures and some lake effect snow later this week. A chance of showers before 9am, then periods of rain, mainly after 9am. High near 55. Windy. Chance of precipitation is 100 percent. New precipitation amounts between a quarter and half of an inch possible. A chance of rain and snow showers before 1pm, then a chance of snow showers. Partly sunny, with a high near 36. Southwest wind 14 to 18 mph, with gusts as high as 31 mph. Chance of precipitation is 30 percent. A chance of snow showers before 1pm, then a chance of snow showers after 4pm. Partly sunny, with a high near 35. Chance of precipitation is 40%. A chance of snow showers before 8am. Partly sunny, with a high near 36. Chance of precipitation is 30 percent. A chance of snow showers. Partly sunny, with a high near 35. Chance of precipitation is 30 percent. A chance of snow showers. Partly sunny, with a high near 33. Chance of precipitation is 40 percent.